Home / Reviews / Holiday 2014 / Plasmacar Review! Have you seen a plasma car before? These things are so neat! One of my favorite toys right now and the best part is that it runs on kid power. 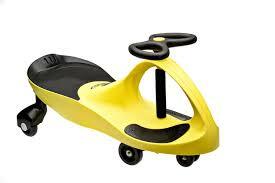 No batteries, gears, or pedals, this works with back and forth arm movement and lets kids propel themselves forward. We need a lot more toys like this! An amazing thing that this is great for is big kids, it has a weight limit all the way to 220 pounds, parents can have a blast with this toy as well. We have this fun, easy to assemble, simple to ride, and great toy that anyone over three can ride and up to 220 pounds, which means this toy can be ridden for a long time. To make it go you simple turn the wheel and to make it stop you simply stop turning the wheel, it is just brilliant! I loved that this car was very easy to assemble and that it was easy to keep clean, we have a lot of sidewalks around here and that makes for some great rides on the PlasmaCar, everyone in our neighborhood loves it so much, they never give the wheels a rest. Between the little kids and the big kids, this is one sturdy little car that gets used quite often around here. They tell you it is not suggested on wood floors, it may damage them, so I would heed that warning, however, besides that it is pretty no holds barred. We wear helmets, and make sure the little ones don’t get out in the street, but it really is one of the best toys of the season. Any child would love to find this under the tree this year, this gift is going to be a hit! I feel that if you want to make sure you have a happy child on Christmas morning and beyond, the PlasmaCar is a must buy gift. My granddaughter would love riding one of these. I probably not but I know my husband will! I don’t think I’d fit on it but I’m sure my kids would love riding it! Such a cool little car! I don’t think I will ride it but I know the kids would. They love things like this. this car looks like a lot of fun!! i want to ride it!! ABSOLUTELY, I would ride it!! It looks like a BLAST!! Thank You for the chance to win it!! Awesome my nephew would love love love to get this. Yes! I’d love to try it out!! 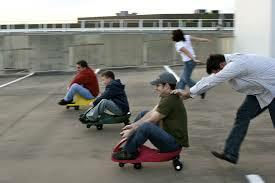 This looks so much fun love a couple of them so we can race on them! I would love to ride it but I’m too big. Past the weight limit. Looks like lots of fun, And I love having fun. So yes yes yes I would ride it. This is awesome! Fun for the whole family! I dont think that I would ride it, but i’m sure the kids and nieces and nephews would get a kick out of riding this! Hey I would give it a try. It looks like great fun! I’m sure my grand kids would quickly take it over but I would try it! Such a cool little car! Fun for the whole family! I do not think I would get on it and ride it. I am a little to hefty. We have plenty here that would ride it though!